I spotted this brass platter leaning against the wall at a friend’s house. Check out the dragons in the border. Embossed platter at a friend’s house. They look a lot like lindworms, with only fore paws and the long tail but no hind legs. However, my sources disagree whether a true lindworm would have wings. This is a passage from my first published novel, The Magister’s Mask, released by Dragon Moon Press in 2004. It’s the tale of a young sorceress, Shenza, who has been trained to use her magic in solving crimes. Among the unique creations in this novel is a sea serpent, Taisaris, which is sent by vengeful nature spirits to punish some foolish humans. 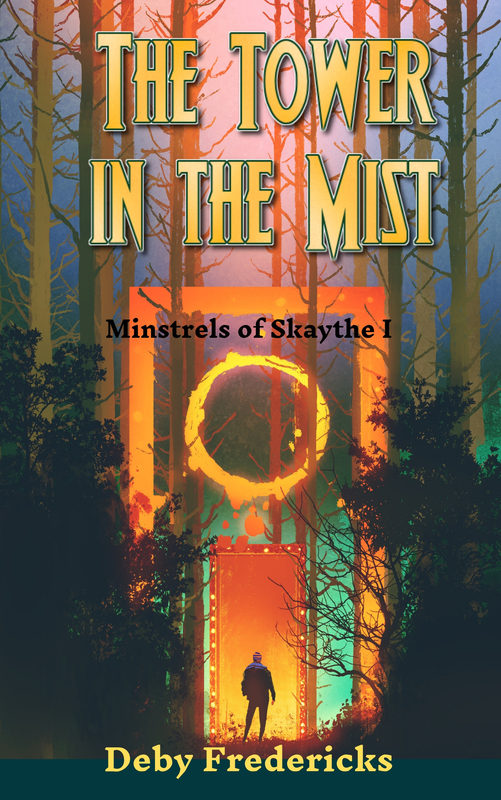 The Magister’s Mask is currently available in trade paperback or e-book. Enjoy! Amid a geyser of spray, something huge broke the surface of the sea just beyond the breakwater. Thin shrieks came from the town behind them. Here was another legend become real. It was shaped like an eel, narrow and long, with a many-fanged maw topping a powerful corded neck. Elegant, spiny fins threw plumes of spray in a hundred directions. Its hide was of a color with the sea itself, a green so deep it looked black in the gloom. When lightning flashed again, phosphorescent stripes blazed along its sides. “Taisaris,” she (Shenza) finished for him. It was said the Eleshouri created the sea serpents to control the currents and tides. But their monstrous forms housed a temper that could swallow up entire islands, and so they were banished to the utmost depths. Only sometimes they crept out to overturn ships and drag the hapless sailors below. Or they might be summoned by their masters, to punish some transgression. The beast roared at the height of its arc, a bellow like the howl of cyclonic winds. Shenza stepped back and bumped into Juss. He steadied her, but did not speak. Taisaris turned in the air with lumbering slowness. then collapsed back into the sea. Its fall raised a wall of spray that obscured the horizon. And then, what she had feared came to pass: over the breakwater, a long hump of water rolled swiftly toward Chalsett-port. Shenza needed no more urging from Juss. She snatched up her travel case and they ran toward the safety of the terrace. Under their feet the boards of the pier trembled with vibrations that grew ever stronger and closer. In front of them, dark-skinned backs of seamen and peace officers together dashed up the stairs. For Shenza and Juss there was no time left. The crack of splintering wood mingled with a greedy roar as the wave struck the lowest level of the town. Juss threw his arm around Shenza’s shoulders, flattening her against the vertical face of the tier above. A hard wash of cold bring pressed them against the stonework with bruising force. It came to her shoulders, nearly lifting her from her feet. A moment later the flow reversed. She could feel the suction dragging at them. For a terrifying moment her sandals slipped, but Juss’ strong arms helped her keep her footing. Then the pressure lifted and the wave fell back with a cheated sloosh. Sea-foam hissed malevolently as the waters drained back over the edge of the quay. I spent the weekend at SpoCon, my local science fiction convention. It should be no surprise that I ran into a few dragons. This awesome fellow was helping out at the security table. This dragon was hidden in the carpeting. She’s a mistress of disguise. Can you spot her? One of the great heroes of Persian lore is the mighty warrior Rostam. He is part of several legends, but the most substantial of these is the epic poem Shahnameh, recorded by Ferdowsi around 1010 C.E. Rostam dwelt in Sistan, part of modern-day Iran, where he stood high in the favor of King Kay Kaus. Unfortunately, the king undertook an ill-fated invasion of neighboring Mazandaran. He was defeated and captured. Learning of this, Rostam rode to the rescue on his faithful stallion, Rakhsh. The hero endured several trials. He was lost in the dessert and battled a lion, several demons — and a dragon. Rostam was asleep one night when Rakhsh heard a noise near the camp. A dragon was lurking in the bushes! The horse whinnied and stamped on the ground, making such noise that the hero woke up. He also forced the dragon to retreat, so that Rostam saw no danger and was highly annoyed with his steed. He lay down to sleep again, but a short time later the dragon returned. Again, Rakhsh sounded the alarm and woke his master. Rostam was furious and threatened to kill the horse, but then he spotted the dragon! The battle was joined, the monster was defeated, and all was well. One hopes that faithful Rakhsh got a good brushing as reward for his help. Word has come that Haruo Nakajima has passed away. Nakajima was the Japanese actor who originated the seminal role of Godzilla (1954). Clad in the trademarked gray rubber suit — the initial films were in black and white — he stormed across the countryside and laid waste to cities in a dozen Godzilla movies. Nakajima worked hard in his role. To develop Godzilla’s distinctive walk, he studied the movement of animals such as bears and elephants. Just to wear the suit was physically demanding. Some versions weighed over 100 pounds! For all the technical limitations and hokey plots, Godzilla remains one of the world’s most beloved film franchises. Not a bad legacy for a guy whose face was never seen on camera.